As you can see by my emphasis, the part of this passage that has been most disturbing to me is the last part of verse 8. James is stating that a double-minded person is unstable in all of life! I am deeply concerned about the double-mindedness that has taken a vast number of Christians captive. The dictionary defines double-mindedness as wavering in mind, vacillating. It also explains that a double-minded person is marked by hypocrisy. 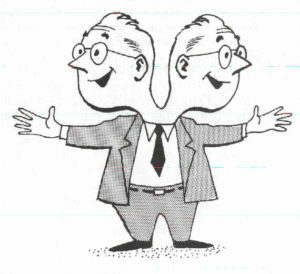 However, the real danger of being double-minded is not simply due to one not being decisive. The true mark of a double-minded person is the compartmentalizing of one’s life. One of the most common realities found in the lives of a vast majority of Christians is that they have divided life into two compartments — the sacred and the secular. By doing this they attempt to live their lives according to two different worldviews. The late Dr. Albert Greene referred to this type of thinking as dualism. Dualistic thinking will always lead to dualistic living. The most common way of illustrating dualism is to explain how many people will live their lives on Sunday much differently than they live their lives Monday through Saturday. This is a result of thinking that some areas of life are spiritual in nature. These include things such as attending church, reading the Bible and spending time in prayer. At the same time, other areas of life are considered to be secular or religiously neutral in nature. Such things as politics, business, education, and recreation fall into this category. The end result is that a dualistic person’s life does not have an overarching worldview that brings all of life into unity. Life ends up extremely fragmented and doesn’t make much sense. It also makes it very difficult, if not impossible, to find significance in what we do and who we are. James hits the nail on the head — this type of person is unstable in all of life. Someone who is unstable cannot function properly. Even though many Christian educators decry dualism, I am wondering if double-mindedness hasn’t crept into our homes, churches and schools. There are some dangerous trends that I see taking hold in our efforts to give our children a biblical worldview integration. I believe I need to make a disclaimer about what I am about to write. Some of the practices that I am going to mention may or may not be right or wrong. However, I am bringing them up to foster consideration and discussion. If the opposite of dualism is living all of life under a unified worldview, then we must examine all of our practices involved in educating our children and youth to make sure everything is governed by a biblical worldview. As I bring these issues up, I ask that you ponder them in light of this question. Is this leading to double-mindedness? If it is, does it mean that we are becoming unstable in all our ways? This is a hot button to start our discussion. I have heard all the arguments from both sides of the aisle as to what textbooks Christian schools should use. I recently wrote an article for another publication and titled it The Hidden Agenda. The essence of the article is that all textbooks, both secular and Christian, strive to be “academically rigorous”, factually accurate, and relevant to life. However, there is a hidden agenda in all textbooks. Every textbook is written from a worldview perspective with the goal of taking the students minds captive by its underlying belief system. I am not going to argue the pros and cons of using one textbook over another. I am simply asking you to consider the possibility that we might be practicing dualism if we say we want our children to develop a biblical worldview but then immerse them in secular worldview written textbooks. When making textbook selections, do we consider this passage in James 1? If not, could we not only be practicing dualism but also leading our students into developing a dualistic mindset? Christian education has come a long way when it comes to these school programs. This is one area that I am starting to see schools adopt a very worldly/secular pursuit of excellence. Again, there is not time and space to address the entire topic of excellence in this post. I will simply point out that worldly excellence is pursued from a purely horizontal perspective based on comparing and competing. One is excellence if he/she is better than the other person. Biblical excellence, on the other hand, begins with a vertical perspective and is focused more on character than performance and achievement. With this in mind, we must ask ourselves a couple of questions if we are going to avoid double-mindedness. Have we developed these programs within the context of a biblical worldview with the same intensity as we do our “academic” disciplines? Many schools have to use community coaches and sponsors to lead these important aspects of our schools. Are we being as intentional with developing these staff members with a biblical worldview and philosophy of education as our full-time teachers? If we do not answer these questions accurately, we may end up being unstable in all our ways. This has become a major aspect of the curricular offerings at many Christian schools. There are some real “perks” to offering students opportunities to take certain courses under a dual enrollment program. A dual enrollment program allows students to enroll in classes at their school through an arrangement with a college or university. This allows the students to earn both high school and college credits. Some students earn as many as 15-20 college credits before graduating from high school. All of this sounds great but are there some dangers that are inherent in these types of programs. Many schools are doing dual enrollment programs with secular colleges and universities. Others offer these programs in partnership with Christian institutions. I realize that if a Christian school has staff members with the proper degrees, they can actually teach these classes. However, many times these classes are taught by a secular professor using the textbooks and other resources from the partnering college or university. Again, I am merely asking that we give careful consideration about how this could lead to dualism. Would we hire an unsaved teacher to teach in our schools? I hope we would answer this question in the negative. However, are we doing the same by some of the dual enrollment programs? I have mentioned three areas where I see that dualism could creep into our efforts to biblically educate our children and youth. There are probably more and this can be discussion for another time. However, we must evaluate everything we are doing in our efforts to provide our children and youth with a biblical worldview education. We cannot open the door for dualism to get a foothold. If we do, we will become unstable in all we do. It can also be quite concerning when a Christian school teacher has received all his/her training in secular colleges and universities. Unintentionally that teacher may well be giving her students a secular worldview even though she is a believer. That’s why Christian school educators must have biblical worldview training too! Your thoughts on double mindedness cause me to reflect on the increasing mental illness concerns in our culture and society — an inevitable result!